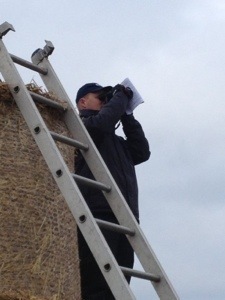 Running the Rule over Sundays Fairyhouse Card. Bar One Racing are the main sponsors of the second day of the two day fixture at Fairyhouse with a really interesting days racing down for decision at the Co Meath track. With the going an unseasonal good to yielding on the hurdle and chase tracks it should deliver some exciting racing for racegoers and the armchair punter. The Hattons Grace Grade 1 Hurdle sees 5 intended starters with both Willie Mullins and Gigginstown House Stud being double handed leaving only Jessica Harrington’s Jezki to complete the line up. Both the going and the two mile four furlong trip provide a couple of factors that will define the outcome in my view. Jessica Harrington opted to miss the Morgiana Hurdle with the 5 year Milan gelding Jezki and run here instead. This 8 time winner races in the famous green and gold colours of JP McManus and will have the assistance of AP McCoy in the saddle. His form is over 2 miles and his win at Down Royal proved his well being. The Gigginstown House Stud pair represent two different stables with Davy Russell opting for the 4 time winner Rule The World for Mouse Morris. While Bryan Cooper gets the leg up on Dedigout for Tony Martin. Rule The World a 6 old by Sulamani returned from an injury sustained at Punchestown last spring to win at Naas, while Dedigout a 7 year old son of Bob Back looks much more comfortable over hurdles than fences but may not be over enthusiastic about the going. Ruby Walsh takes Zaidpour as the strongest of the Willie Mullins pair with the only 4 year old in the field Diakali to be ridden by Paul Townend. Sussannah Ricci’s 7 year old Red Random gelding Zaidpour is an 8 time winner, the last in December 2012 here while Diakali a son of Sinndar has won five times the last at Naas three weeks ago. I am a little concerned for Rule The World with just a niggling doubt in the back of my mind that his recovery from injury is not as clear cut as it might be. While Dedigout is better hurdling than chasing if his form is to be believed with the ground not suitable for Zaidpour and Diakali may struggle at this level. So whats the likely outcome, Jezki for me has both the class and pace to win with no stamina doubts on this ground in my view. The Grade 1 Bar One Racing Royal Bond Novice Hurdle has a really competitive field of 10 to face the starter with everyone of them holding out some sort of chance. Willie Mullins provides 3 of them in the shape of Alonso, Arctic Fire and Renneti, Jessica Harrington has Mr Fiftyone and Gambling Girl, Gigginstown House Stud have Somethingwonderful and Very Wood for Dessie Hughes and Noel Meade with the reminder of the field made up of Gilt Shadow for Stuart Crawford, Minella Foru representing Edward Harty and The Tullow Tank for Philip Fenton. If we take the Wexford winner Alonso as the choice of Team Mullins with Ruby Walsh booked, the 4 year old son of Green Tune would need to step up more than a few notches to win here. Mr Fiftyone may be the strongest of the Jessica Harrington pair with Barry Geraghty in the saddle, while Noel Meades Very Wood is the Gigginstown number one. The other three look strong with Minella Foru the form choice from the very promising pair of Gilt Shadow and The Tullow Tank. So its make the mind up time with the French bred 4 year old Very Wood just getting the vote. The son of Martaline needs everything to go his way to win for Davy Russell and Noel Meade. The other Grade 1 on the card is the Drinmore Novice Chase where 6 horses face the starters white flag over 2 miles 4 furlongs. I think that I will narrow this down to 4 horses with winning chances. Dessie Hughes has a nice 5 year old chaser in the shape of the Exit To Nowhere gelding Art of Logistics. This dual winner is progressive and will be in the final mix, while Tony Mc Coy’s Galway Plate winner Carlingford Lough is a more than interesting participant for John Kiely. Gigginstown have yet another live chance here with Don Cossack who had his colours lowered by Morning Assembly at Punchestown. That horse is very promising and a defeat to him in a tight finish was still very good. While Henry De Bromhead makes up the quartet with Sizing Rio. This 5 year old son of Heron Island has caught the eye particularly at Cork. Racing in the colours of Ann and Alan Potts his win at Cork last time out makes him the choice here for Andrew Lynch. The first race on the day is the Juvenile 3 Year Old Hurdle over 2 miles. This Grade 3 race has 8 intended runners with the Gigginstown House Stud holding the aces here with Analifet and Clarcam both sired by French stallion Califet. This could be a battle between Ruby Walsh and Davy Russell in that owners colours with the Willie Mullins filly Analifet the stronger. Tony Martin, Barry Connell and Danny Mullins do introduce an interesting French import in the shape of Elishpour here. It wouldn’t be a huge surprise if this Oasis Dream gelding made an eyecatching start over hurdles. Continuing our preview the Irish Stallion Farms support the Mares Handicap Chase. Run over 2 miles 4 furlongs the recent Clonmel Grade 3 winner Ballinahow Lady could make a forward show here for John Cullen and David O’Brien. I would be concerned that the 8 year old Beneficial mare has to give up to two stone in weight away to her 8 rivals and that she may have to give best in the end. My choice here is Colin Bowes Glibin, with the 8 year old Luso mare capable of a good show here for Mark Walsh. 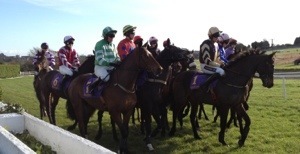 The Grade C Porterstown Handicap Chase has 14 runners facing the marathon 3 mile 5 furlong trip. Here Sword Fish who won the Cork National carrying a feather weight has 11-4 to shoulder this time with Caheronoun, Prosperity Square and Slew Charm all previously tipped, unsuccessfully in the past weeks line up again. I fancy Pat Fahys Thelobstercatcher here to finally win a good prize. The bumper as always could take hours to fathom out so lets go with WP Mullins, Patrick Mullins, Ann and Alan Potts and Sizing Venezuela to land it. The 4 year old Arcadio gelding is from a nice family, is out of a Roselier mare and could be interesting. Spotted in Running, from a Beauty to a King. Aidan O’Brien seems to be putting a nice string of National Hunt horses together this season with many waiting just to see who might be in line to take out a trainers licence to handle any increased numbers in the short to medium term. But enough of idle speculation, the Ballydoyle maestro did introduce a nice bumper horse at Punchestown on the 17th when the JP McManus owned MacBride finished third under Sarah O’Brien. Well touted beforehand the 7/4 favourite failed in a tight finish with only a pair of heads separating all three. This 4 year old son of Oscar looks sure to win next time out if presented with the right opportunity. The winner of that bumper, Lieutenant Colonel, is trained by Dessie Hughes and was ridden by Johnny (JJ) King to win. The Co Tipperary based amateur jockey was also one to put into the notebook at Lingstown on the 24th when he finished an eyecatching second on The Wexfordian. This horse was another debutante with the 4 year old Shantou gelding running a good race in Peter McCreas colours behind all the way winner One For Arthur. Home bred by McCrea, King wasn’t hard on the horse and he is sure to pick up a maiden for his astute trainer Liz Doyle. John Kiely has had Kilbarry Beauty on the go since a bumper win in Cork in 2012. Owned by Claire O’Keeffe the 6 year old daughter of Saffron Walden finished strongly at Wexford in the 2 mile novice hurdle on the 19th under Paul Townend. It would be no surprise to see her stepped up in trip to justify support next time out. O’Keeffe is of course wife of Con O’Keeffe from Kilbarry Stud where they stand Garuda and Classic Cliche as stallions. Thurles on the 21st saw Declan Queally ride a patient race on Mm Dazzler in the 2 mile bumper behind Western Boy to finish second at 25/1. The Fruits of Love 5 year old is trained by Adrian Maguire and has progressed out of the point to point fields to merit attention when he next runs. Denis Murphy part owns the point to pointer Abhainn Dubh with Martin Kelly. This 5 year old son of Coroner had failed to get around on his last two starts at Kinsale and Curraheen. 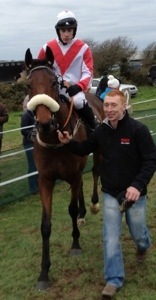 He did however manage to put in a clear round at Lingstown to finish third behind Crazy Jack and Johnny King. He was held up out the back for most of the 3 mile trip and just didn’t have the speed to catch the leading pair. Murphy should be able to find a winning opportunity for him before he is sold on. King himself is worth watching as his performances over the past week mark him down as a man to watch both on the track and between the flags. As always, these were spotted in running and it’s no harm to see where they race again, after that it’s up to yourself !!!!! Will Mikey O’Connor take the Open at Ballindenisk? I know that we love talking about the weather here in Ireland but it’s extraordinary that a December Point to Point fixture has to be abandoned because the ground is too firm!! 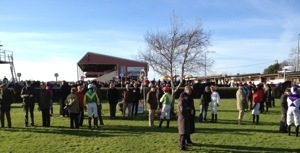 The Island Hunt at Ballydarragh was a victim of such a weather phenomenon with their December 8th fixture abandoned. To be truthful it wasn’t a huge surprise given the level of rain that hasn’t fallen in the past few weeks but it is a disappointment for the dedicated Island Hunt, for the Kenny family on whose land it was to be staged and for the Point to Point sector as it reduces the number of races available. Little can be done bar praying for rain so that their 2014 fixture at Ballydarragh can be staged!!!!! So what’s on this weekend? Two meetings are scheduled for Sunday next the 1st. The United Hunt will race at Ballindenisk with a start time of 11.30 while the Tipperary Foxhounds are in action at Lisronagh with the first flag fall at 12 noon. The entries at both indicate that their six race card will remain intact with only an outside possibility that any divides are required. But that totally depends on the declarations on the day and whether anyone who had intended to wait till Ballydarragh will take the chance and race a week earlier! Lisronagh has 138 pencilled in while Ballindenisk has 112 listed in their entries. With Derek O ‘Connor out of action following an accident, a number of the other jockeys will be hoping to add to their winning tally before the national champion returns. Mikey O’Connor, Ciaran Fennessy, Paul Power and Irene Walsh may head to Ballindenisk on Sunday if they have a good level of bookings on the day. The Electrical Pump Services sponsored Open Lightweight has 15 entries with a couple of notable names amongst them. Liam Lennon has given an entry to Tammys Hill with the 8 year old son of Tamayaz one of last seasons top hunter chasers a likely favourite if making the trip from Co Down. He hasn’t run since June so his fitness is taken on trust. He may not have all his own way as Enda Bolger has Near Perfection entered with the Oscar 8 year old having better form between the flags than in his forays on the track. A winner at Lemonfield in October he is sure to make an impression in the JP McManus colours. Sean Aherne has his Kinsale Open winner Harpor in the line up with with the dual Point to Point winner requiring a new pilot here having had the assistance of Derek O’Connor on both these occasions. Mikey O’Connor may try his hand with Make It Better with the 9 year old Son Of Sharp Shot mare looking to make her return from the track a successful one. This 4 time point winner wasn’t entered for the Mares Open at Lisronagh so if she faces the starter her chances could be good. Paul Power has won on both Charlie Swift and Turtle Express this season already so which one if any he rides depends on Vincent Halley and Kate O’Donovan’s plans for their horses. Pocket Reader has given Irene Walsh a great season to date with wins at Curraheen and Affane to her credit. The 7 year old Sonus gelding has been well handled by Eugene O’Sullivan and a noteworthy performance could be on the cards. Jamie Codd, Barry O’Neill, Declan Queally and Johnny King will wear the silks at Lisronagh on the same day assuming of course that their chosen trainers will have a runner or two at the Co Tipperary venue. The Open at Lisronagh is confined to Mares with the entry of 6 most likely a little disappointing to organisers. That said it looks like a tight race with Isourbell and Shiela Aherne certain to try and make it all from the front. This Executive Perk 11 year old has been second on the last 5 occasions having last won at Kinsale in June. Lisrose had some nice track form to her credit earlier this year with the 8 year old Beneficial mare trained by Alice Curran. Vickys Lass an Old Vic 7 year old a previous winner hasn’t run since May 2012 for Joseph Quinn. While Seamus Murnane’s Givemeabuzz has run into the classy The Last Derby at Ballingarry and Rockfield with the 8 year High Roller mare having been on the track prior to that. The good thing is we are racing and as always p2p.ie will keep us up to date over the weekend, so enjoy it wherever you might be. Racing by Numbers, a Week in Review. On the Track Ruby Walsh looks like he may have the national hunt jockeys championship just about sewn up with 71 winners already this season followed by Andrew Lynch on 38, Davy Russell on 37 and Barry Geraghty on 35. Ok, point taken no jockey could be in that position after only 7 of the 12 months of the season but it’s already looking a certainty bar a fall. WP Mullins has hit the 83 mark, already 50 clear of his nearest rival Gordon Elliot on 33 winners with Henry De Bromhead on the same number of 33 followed by Noel Meade and Dessie Hughes with 30 winners apiece. With a fall not going to impinge on the Co Carlow maestro he is going to be the Irish Champion Trainer yet again. While Between the Flags the news came through last Thursday that last seasons National Champion Derek O’Connor had broken 3 bones in his right foot putting him out of action for 5 to 6 weeks. This means he will miss the remaining 6 meetings scheduled for the point to point autumn campaign. Currently on the 8 winner mark he shares 3rd place behind Jamie Codd on 19 and Barry O’ Neill with 15. On the trainers scene David Christie continues to lead with 10 followed by Vincent Halley on 8, Colin Bowe on 6 and Denis Murphy on 5. 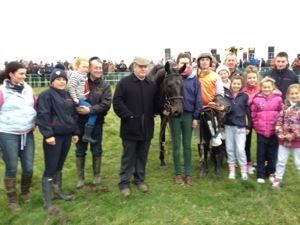 (That’s Denis and family in our photo at Lingstown last weekend). While the sires listing has a new leader with Milan now in front on 8 with Beneficial and Court Cave static on 7 and 6 apiece. Our shortest priced winner of the week was at Wexford on the 19th when Briar Hill took his maiden hurdle at 9/1 on! He opened at 10/1 on and paid €1.10 for a €1 stake on the Tote. Did anyone really put money on him? Foritsa gave young trainer Gordon Doyle his 1st track winner at the same meeting having given him his 1st point to point success in 2012. Royal Caviar won his bumper at Fairyhouse on the 20th at 15/8 on to partly justify the €90,000 spent on purchasing him by WP Mullins. Ascot on the 23rd saw Annie Power a 5 year old daughter of Shirocco win her 8th race on the trot. Retaining her unbeaten record she has now won £151,197 in prizemoney. This mare was bred by Eamon Cleary a noted Wexford hurler and trained by Jim Bolger before switching to Mullins. 8 for 8 is no bad record! The longest priced winner of the week was 25/1 shot Cootamundra in the 3 mile €100,000 Troytown Chase at Navan for John Berry. 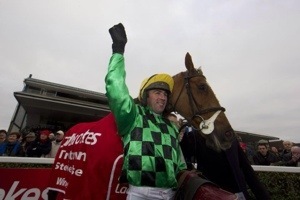 The 10 year old was winning his 1st chase for the Turbine Syndicate and Robbie Moran. Goffs hit the mark at their November Breeding Sale when €6,000,000 was the winning bid for Chicquita. This 3 year Oaks winning daughter of Montjeu is likely to race on rather than go to the breeding barns in 2014. With a single win to her name and a wayward racing temperament it is one hell of a price! The Horse Racing Ireland 2013 nominations are out with 8 people nominated for the Outstanding Achievement Category, 6 horses have been given the nod for the Horse of the Year Category, 5 people are nominated for the National Hunt section, 5 for the Flat section, 5 for the Point to Point category, with a mixture of public voting and the racing media picking these winners. Winners will be announced on the 9th. The Tattersalls Ireland November National Hunt Sale saw the 2013 figures showing 1475 lots catelogued, 1303 offered, 882 sold making €10,850,417. Bales and Boulta and no the bales in this photo weren’t on the bends! But hey isn’t it good to see that what uses can be made of a few sturdy round bales. 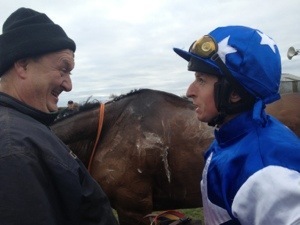 Well done to intrepid race commentator Richard Pugh at Lingstown on Sunday, not quite Leopardstown or Cheltenham but that didn’t stop the p2p.ie guru from calling all the races in his always clear and concise manner. Well enough of that bale talk what happened at Boulta? Eoin O ‘Sullivan followed up his career first victory at Grennan on The Hollinwell in the Open when taking the Lightweight on the son of Classic Cliche. Owned and trained by his father Eugene the autumn campaign has been a memorable one for the 17 year old for young O’Sullivan. Racing opened with Mikey O’Connor continuing his good firm at Affane when taking the 4 year old mares race on Incisal Tip for David O’Brien. This 4 year old daughter of Westerner saw off all comers for her debut victory. The intrepid Con O’Keeffe sent Racing Europe from his Kilbarry yard in Waterford City to win the 4 year old geldings maiden under Declan Queally. This son of Kayf Tara made a pleasing debut at Curraheen and built on it here. Paul Power continued his good season when the Vincent Halley trained Benenden won the first division of the 5 year old maiden. Having fallen on his two previous efforts Power kept the Moscow Society gelding on his feet here to win. The second divide went to Daniel O’Connell’s Zagreb gelding Dandan for Gerry Mangan. The Winners contest went to Co Limerick with Michael Hourigan and Robbie McNamara winning on the Clear Hills for Marju. This horse had some track form and built on it here to record this win. While David Kelly completed the seven race card when his Definite Article mare Inarticulate confirmed her superiority here under Pa King to give Co Tipperary a win on the day. Go Robbie Go and that Troytown win. The Troytown Chase is one of the national hunt years iconic early season races run at Navan in Co Meath. Having been won by some nice horses over the years including Notre Pere, Cane Brake and Cloudy Bays in recent times it retains its appeal to trainer, jockey and owner. This years renewal sponsored by Ladbrokes saw 20 horses face the starter with Cootamundra the only horse entered never having won a steeplechase nor point to point. This of course belies his ability and his previous form which had seen him placed in a number of Black Type chases since winning twice over hurdles. Owned and bred by the Turbine syndicate based in south Co Wexford the now 10 year old son of Broken Hearted finally came good in a tight finish from Mad Brian at 25/1. Based in Duncormick the syndicate includes Joe Moran an uncle of the winning jockey Robbie. Joe is well known in the point to point world having been associated with the legendary Padge Berry over the years. Trained in Blackwater Co Wexford by John Berry a former accomplished amateur jockey this horse is very much the star of the yard at present. Ridden with confidence by Robbie Moran this Grade B success is his first big winner for Berry and a great boost to his professional career. From Cleariestown just outside of Wexford Town the talented Moran has not found it easy since injury affected his career a number of years ago but this win puts him back in the headlines having given him a great opportunity to showcase himself. Moran now 30 years of age is engaged to Kate Molony moved to Thurles a number of years ago and is set up at The Racecourse their. He rides out most mornings for Sam Curling and trains a few point to pointers himself at his own yard.In addition he is regularly seen at the schooling days at Thurles and Tipperary making him a busy man.A former champion conditional jockey here in Ireland he is one of the more polished professionals about. Speaking from his yard Moran commented “It was great to win, but this is a fashionable sport and if you are not winning it is easy to be forgotten about”. Plans for Cootamundra could include a run at Christmas or to wait for Gowran Park in January. But one thing is sure they won’t ever forget Troytown day and the go Robbie go cheers. 27th Dundalk (e), 28th Thurles, 29th Dundalk (e), 30th Fairyhouse, 1st Fairyhouse. 1st Tipperary (F), United Hunt (F). Scintillating Codd has a Lingstown Fourtimer. The Killinick Harriers have probably one of the better tracks on the point to point sector with good ground nearly always available at their Lingstown track. 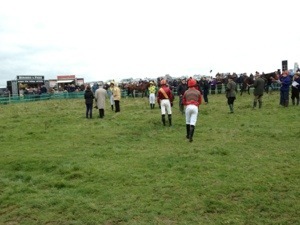 Racing over land owned by the Codd Families from Grange and Churchlands it provides a good test of both horse and jockey with 14 fences having to be negotiated on the 3 mile circuit. The organising committee must have been pleased with the strong attendance on the day with 9 races following three divides with 99 horses declared from an entry of 159. Jamie Codd was very much the man of the day with the Mayglass man completing a scintillating fourtimer on Tricky, Fight Away Boys. Liberty One and Glasson Lad. We also had doubles for Barry O’Neill, Liam Kenny and Denis Murphy with notable first wins for Marshall Watson, Michael Fitzsimmons and JJ King. With an early start of 11am Codd didnt quite manage to take the first race but he did strike in the second division of the 4 year old maiden when winning on Tricky for Denis Murphy. This son of Indian Danehill owned by Ramsgrange Co Wexord man Anthony Ryan did well here under Codd to see off the always prominent Laraghcon Boy to win by 2 lengths. Speaking afterwards his winning trainer commented “He did that well, we bought him at the August Sales in 2012 and we will tip on to resell him at some future sale.” Lingstown is a happy hunting ground for Ryan as two previous runners in his colours have won here in recent years with Knock A Hard and Lord of Drums both winning on the track having been sold on. Murphy based in Blackwater, Co Wexford provided Codd with his second winner of the afternoon with Fight Away Boys winning the first divide of the 5 year old geldings maiden. This 5 year old son of Vertical Speed had some good previous placed form to his name this season having been placed at Tinahely and Grennan and confirmed it here from Liz Doyles The Cats Away. Speaking in the winners enclosure Murphy commented ” He goes away fine, Jamie said that he may have sent him on too early. He is for sale and I would reckon he could make a nice summer racing ground horse in England”. The Winners of One race looked like a good contest on paper and with 14 of the original entry declared and so it proved. Codd had to keep Liberty One a son of Milan up to it as the pace of the race while quick enough had the bulk of them still in a bunch 3 fences from home. Codd got to the front by the second last and tried to make his move a winning one, jumping the last in front he had to withstand a late flourish from p2p.ie owner Richard Pugh’s Schindlers Rock by a length. Owned by North Wexford man Tom Redmond, who happened to be in the Aviva Stadium for that thrilling Rugby match against the All Blacks, Kenny commented “He did that all right, he idles a bit in front. We may go for a hunter chase over the Christmas period” This was the 7 year old son of Milans third win between the flags and while no Gold Cup horse he is pretty good within his own standard. Codds quartet came in the ninth and very last contest when Glasson Lad took the second division of the older horses maiden. Trained in Kells Co Meath by Michael Fitzsimmons this 6 year old by Quws was giving him his first winner from his new yard. The plan is to go for a Hunters Chase at Downpatrick with the former Ferdy Murphy track performer. With the final fence omitted Codd seized the initiative driving his horse to the front on the run down the hill and holding all challengers. Barry O’Neill got his day underway when opening racing with a win on One For Arthur in the first division of the 4 year old maiden. This son of Milan went off favourite having shown up well at Ballinaboola and Tatts Farm and he led all the way having jumped superbly to win in the Big Zeb colours of Pat Redmond. This was a good day for the Redmond brothers as both Tom and Pat had a winner with One For Arthur and Liberty One giving Kenny a nice double. Speaking afterwards Kenny said “We didn’t know what to do, but he will have a break now and maybe come back in March. But there is a chance he could be sold”. O’Neill followed up with Maple Mons in the 5 year old mares maiden when running out a comfortable winner for Co Fermanagh based David Christie. Owned and bred by the Charles family from Co Donegal the Great Exhibition mare had been placed second on six previous occasions. Christie who was understandably pleased afterwards declared “She is hardy and genuine and is still growing.She has been consistent and unlucky but I feel she will improve and improve. She will have a break now but id say she could do with some quick summer ground” Christie interestingly informed the assembled reporters that he had spent two hours the previous night looking for the mare amongst the deer on the farm! Obviously with no ill effects to anyone on the evidence of this win. The Open Lightweight run over the Banks course saw 11 horses stand their ground with Long Strand and The Last Derby both declared. Both of them had to give best to the Paul Magnier trained, Ann Ronan owned and Kevin Power ridden Duers on the day. This 11 year old son of Rudimentary took it up from Ma Chara a long way out and jumping superbly skipped his way around the course to win by a very long looking 10 lengths. This eight time track winner seemed to revel in the conditions and over the course and is currently for sale according to Magnier. Marshall Watson the rookie 21 year old trainer from Co Armagh set out from his base at 5am with a hope of winning with Finea. This Exit To Nowhere 6 year old had been placed on the track and well handled by Co Westmeath amateur Mark Lynch they won convincingly for the JAM Syndicate. This was Watsons first winner and the intention now is to return to the track and a crack at the Hunters Chase at Downpatrick. Crazy Jack brings our report to a conclusion with Johnny King recording his first ever Lingstown win when seeing off two local horses in the shape of The Boss’s Dream and Abhainn Dubh. King kept the Royal Anthem 5 year old nicely balanced to win for his owner/breeder Martin Campbell from Galway. Trained by Eoin McCarthy in Listowel Co Kerry, Campbell indicated afterwards that “he might go to the track or be sold” This was another first for everyone involved as it is the first horse the Campbell has had with Mc Carthy and their first winner. Oscar, Dogora and The Game Changer promise much at Gowran. Racing at Gowran Park is always a good day and with todays interesting card it promises much. The going will be yielding according to the forecasts so the 7 race card should not throw up too many surprises. These might be famous last words… you never do know but let’s look at the best options. The afternoons highlight is the Race That Stops A County “Thyestes Jan 23rd 2014 Chase. This 2mile 4furlong race has four horses scheduled to face the starter with an interesting race on offer. Jessica Harrington’s Oscars Well looks the form horse here with some really good graded place form to his name. He has come out second best against Twinlight, Arvika Ligeonniere and Benefficient in 2013 and is due a win here. That said he was a little disappointing at Down Royal earlier this month behind Rolling Aces but he did have Henry De Bromheads Buckers Bridge behind him that day and should confirm that superiority again here. Tony Martins Savello is an interesting character but the 7 year old Anshan gelding hasn’t run since March, while Paul Carberrys Blue Canyon a 5 year old by High Chaparral might not have the class to see these off. I would imagine that Oscars Well will take this for his Co Kildare connections. The Irish Stallion Farms EBF Beginners Chase sees seven runners with Willie Mullins introducing Dogora with Paul Townend in the saddle as Ruby Walsh is at Ascot for the return of Annie Power. This 4 year old represents the Anngrove Stud stallion Robin Des Pres and has good 4 year old hurdle form to warrant serious attention here. Two Scoops for the Henry De Bromhead and Andrew Lynch team looks the likely challenger. This 6 year old Alderbrook gelding has disappointed me a little over fences, particularly as he started favourite on his last two runs but he could have an edge on fitness. On balance I would prefer Dogora here, but I wouldnt be surprised to hear more of both himself and Two Scoops later in the season. The Santa Train at Gowran Park Novice Hurdle looks like a very competitive contest with Mullins and Townend being represented here by Arctic Fire. This German bred son of Soldier Hollow made a noteworthy hurdle debut at Tipperary last month with a step up in class being on the cards. His classy rivals here amongst the nine other declarations include Ange Balafre a dual winner for Noel Meade, Noah Webster a surprise winner last time for Aidan O’Brien and The Game Changer a Cork bumper and hurdle winner for Charlie Swan. Gigginstown House Stud own the 4 year old Arcadio gelding and I feel that Andrew Lynch may just get the better of all comers on this horse. Racing opens with the 3 year old hurdle having 14 hopefuls facing the white flag. It is hard to get overly excited by those with previous hurdle form so the choice here is for a newcomer in the shape of Windsor Queen. Trained in Co Wicklow by Prunella Dobbs the daughter of Windsor Knot who stands at the McEnerys Rossenara Stud might just surprise all here at each way under Mark Enright. Two handicap hurdles are placed in the middle of the card with the 2 mile hurdle for horses rated between 80 and 95 attracting twelve runners. A number of them have form with John Berrys Thurles winner Famous Ballerina with Denis Hogans Island Villa looking the best of them. This Turtle Island gelding will be ridden by his trainer again here and may get most to do from Arthur Moores Positive Vibes with David Casey in the saddle. The Mares Handicap Hurdle has quite a number of previous winners in the field with Evesham Star and Rob Jones getting the nod from Emily Gray. Charles Byrnes sent the 9 year old Evesham Star a daughter of Flemensfirth to win at Wexford in October having earlier in the summer had good placed form at Kilbeggan and Listowel. Martin Ferris gets the leg up on Emily Gray here with the October Limerick winner likely to be next best. Racing concludes with the Irish Racing Yearbook Handicap Chase over 2 miles 2 furlongs with Araglen Lad a 7 year old by Chinook Eclipse a hopeful selection to win for James Lambe and Robbie Colgan. They didnt run up to expectations at Down Royal and may be supported again. On the Track and Between the Flags eyecatchers. It’s been a pretty busy couple of weeks with little chance sometimes to catch your breath and look at some good performances for the future. Between the Flags Donnchadh Doyle was a little unlucky at Affane when his 4 year old Rough King fell when leading at the last fence under Andrew Latta. He had been in front for most of the 3 mile journey and looks certain to win irrespective of where or when he runs. Sparkalark was another last fence faller that caught the eye this time at Ballinaboola. The 4 year old was running a good race behind Old Storm on the day under Paul Power when coming to grief. Trained by Vincent Halley in Waterford this Flemensfirth gelding would be a serious option for punters over the coming weeks. On the Track Willie Mullins sent his 6 year old mare Supreme Carolina to Clonmel where she finished well taking second place in the 3 mile hurdle behind Questions Answered. This 6 year old Traditionally mare was given a tender ride and looks capable of adding to her race record for the Co Carlow based genius. Staying over the jumps Dessie Hughes has seen his Indian Icon placed in a couple of 3 year old hurdles, the last at Navan. He must however be hopeful that the 3 year old can recoup any losses incurred on his last couple of runs. Hughes would have a good line to this world of 3 year olds and I feel he will gain a winning bracket soon. Big Generator ran a nice race in a 2 mile hurdle at Navan with the Jim Mernagh owned 7 year old son of Generous finishing second. Paul Nolan is astute at placing his horses and this horse is equally at home over fences or hurdles and might win again if allowed to lead in a more restrained fashion. These are a few horses that have caught my eye and should be worth following.